The basis for the sanskrit language is that sound, made up by vibrations, equals energy. Once a practitioner connects with the energy-field regulating breath (prāṇa), a heightened awareness power arises which then makes it possible to expand with the “body” of this field (riding the wave of spirit) hence sensing the constitution of the room, surrounding people, plants and even spirits. This then leads towards realization that it (samsara) is all of One Energy, one vibration, originating from the One Mind, e.g. your true nature before your parents were born. We do not only speak of sonic awareness here but of THAT which enables (by its awakening power – bodhi and awakened power – prāṇa) the ability to BE AWARE OF TRUE SELF, which is Mind Only. Sanskrit means polished, refined or perfectly composed. For every sound in sanskrit there is just one sound (vibration), and for every letter, just one sound. Sound affects consciousness and hence to know the intrinsic nature of a single vibration is to know how to control or interpenetrate the consciousness. A sound here can be internal or external, which basically means it can resonate in the material body of the practitioner or in his or hers composed mind. The effect is the same because the Mind that creates the vibration is the same. Once created, as such, it is not possible for a vibration to change nature. How it is interpreted by the no-mind is another question though. Hence we speak in Buddhism to see or know the real as such or as filtrated, changed via delusion. When a temple bell rings in a zen temple what you actually hear is complete silence of the act, yet within that silence a resonance echoes in your no-mind because this no-mind is connected to the One Mind. It is a resonance recognized instantly as a “bell-sound” by all connected to the bell by interdependent origination. Thus we speak of sameness of Mind in all here, or the One Mind in all sentient beings. The same goes for the vibrative appearance of a crow and the sound it seems to make; the sound of rain outside your window, or the wetness of raindrops on your face as you run through the rain. All this is energy in Mind Only, fluctuating in vibrative patterns or waves, governed by the Mind and experienced (translated) by the no-mind, e.g .your composed matrix or body consciousness. You are One Mind, unborn, uncreated, here as such before the birth of what you believe or believed to be your parents or the sudden unconsciousness of sleep. You have nowhere else to go because your true nature is pure Mind, always creating waves (of energy). Thus you have the complete freedom to be whatever or wherever this energy is. Or simply remain as Mind Only. 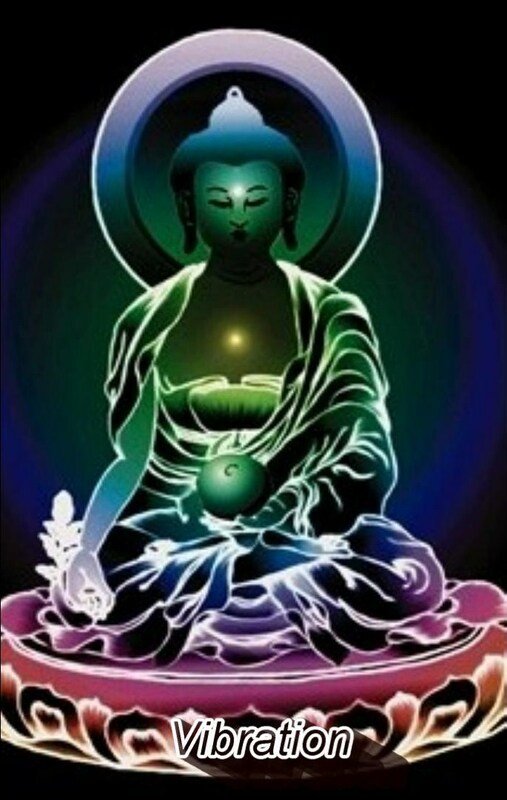 Mind, over matter, is for those obsessed with understanding bodies of matter and the senses derived there from (Hinayana), while Mind, over energy, is for bodhisattvas beyond any positioned body in time space and hence devoted to the suprapositional light/energy of spirit, (Mahayana). Contemplate that and you have but entered the real, deathless body, of Tathagata Zen; the mystical path of all bodhisattvas. To understand the latter is to defeat the illusion of birth and death “here” in the real body of yourself and nowhere else, i.e. (the illusion of otherness). This entry was posted in The Dragon Mind of Zen Tarot and tagged illusion, interdependent origination, Mind, One Mind, Prana, Tathagata Zen, vibration. Bookmark the permalink.